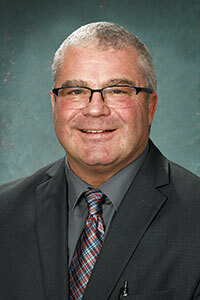 Sen. Rick Outman is a graduate of Lakeview Community Schools. He later went on to earn a bachelor of science in teaching from Grand Valley State University. He has a teaching degree in both biology and Spanish. Outman is a veteran of the United States Army, and the National Guard 1073rd in Greenville. His professional experience includes working as the owner of Outman Excavating. Outman was elected as a member of the Michigan House of Representatives in 2010 and represented the 70th District until 2016, when term limits prevented him from seeking another term. In that time, Outman chaired the Michigan Capitol Committee and was a member of House Committees on Agriculture, Commerce, Elections and Ethics, Energy and Technology and Families, Children and Seniors. In 2018, he was elected to represent the 33rd state Senate District, which includes the counties of Clare, Gratiot, Isabella, Mecosta and Montcalm. Outman currently serves as chair of the Senate Committee on Environmental Quality. He also is an active member of many organizations, including the National Rifle Association, Right to Life of Michigan, Six Lakes Chamber of Commerce, Montcalm County Farm Bureau and is a member of the Hough-Pontius #3701 VFW post in Lakeview. He was involved in area schools, assisting with the Lakeview Schools wrestling teams and as tournament director for Lakeview Freestyle Club. He also served on the Board of Directors for the Montcalm County Soil and Conservation District and is a member of the Austin Hunting Club in Atlanta, Michigan. Outman lives in Six Lakes with his wife Kris. The two have three children and two grandchildren together.